While Phuket’s west-coast beaches are home to ever more modern hotels, swanky beach clubs and sun-baked tourists, Ko Siray on the east coast reveals a lesser-known, more humble side of the island. Just six kilometres from Phuket Town and a world away from the five-star resorts sits Phuket’s largest sea gypsy village. 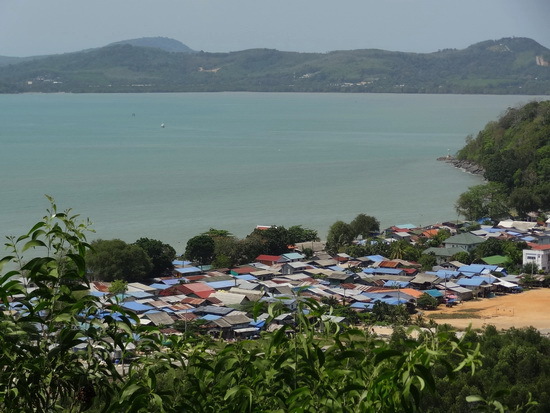 Tin roof kaleidoscope: sea gypsy village, as seen from Wat Siray hill. Some 1,900 Chao Lay, or sea people in Thai, dwell in a ramshackle beachfront village on Ko Siray’s Laem Tukkae (Gecko Cape). They call themselves Urak Lawoi, and share a similar Malay-influenced language to the Urak Lawoi on Ko Lanta and Ko Lipe — a distinct culture within the larger group of sea-roaming Andaman coast tribes known as the Moken. Development on Thailand’s beaches and islands and fishing restrictions in national park waters have forced the once-nomadic sea gypsies to settle. 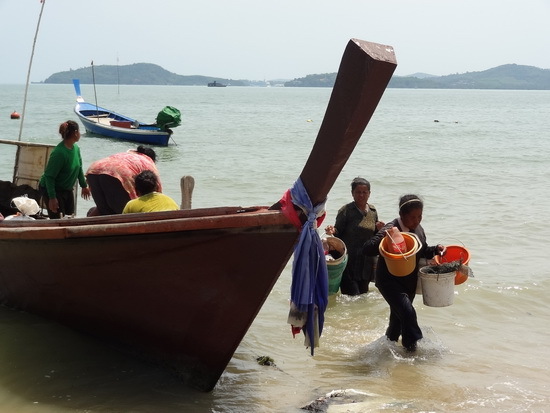 As a culture with little sense of ownership, the villagers’ rights to live on this prime beachfront land, which they don’t own, are constantly under threat — a struggle they share with the sea gypsies on Phuket’s Rawai Beach. Sea gypsy women arrive home with the day’s catch. 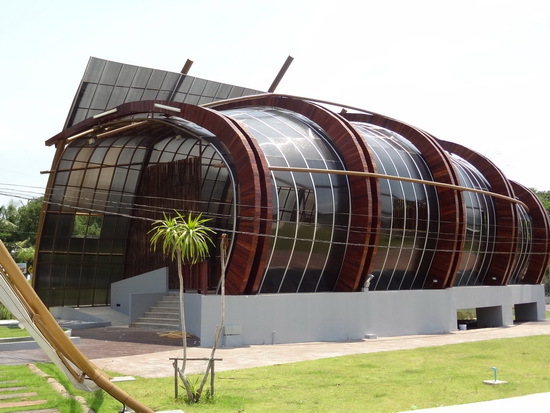 Along the road leading to the village sits the Sea Gypsy Culture Centre, which is a striking example of the gap between the aspirations of the sea gypsies and those who, possibly with good intentions, hope to promote the sea gypsy culture as a tourist attraction. The gleaming oval-shaped building was commissioned by the local council and the clever architecture shaped like the sea gypsy’s fish traps won a national design award. Though the building was completed in early 2012, it remains unused. The glorious glittering, abandoned culture centre. Fishing remains the sea gypsy’s main form of income, and some of the village women have set up stalls selling cultured pearl jewellery and, somewhat controversially, sea shells of all sizes. The village’s main road runs the length of the 700-metre beach. Aside from a beachfront restaurant and the jewellery stalls there’s very little set up for visitors. Though they’re a bit shy, especially compared to the more gregarious Thai culture, the sea gypsies welcome visitors and don’t seem to mind if you wander their streets or watch as they construct their mangrove-wood fish traps. 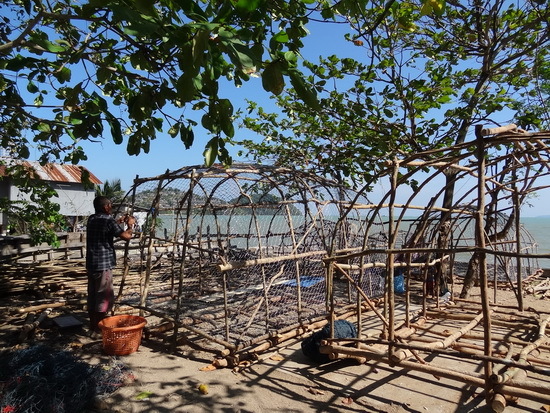 Fish traps in the making. We’ve been to the village several times but found it more rewarding to go with a guide. Khun Chaya of Phuket Heritage Trails was able to give us more insight into the tribe’s history and culture and help us communicate with some of the villagers, who speak Thai as well as their indigenous language. It was part of a tour that included a walk around Phuket Old Town. 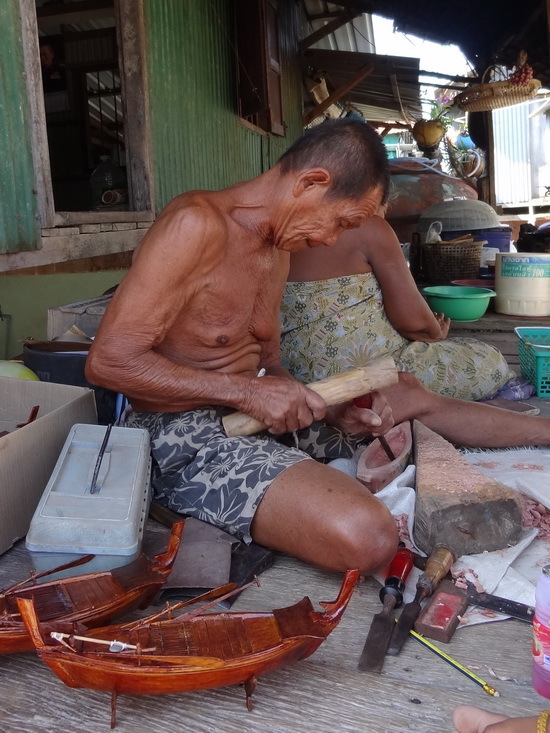 On our guided visit we found Khun Manee, the village chief, busy carving a model of a traditional Urak Lawoi boat together with his wife. He proudly showed us a few of the models he’d completed already, pointing out the differences between the Urak Lawoi models and those of the Moken of the Surin islands and other northern Andaman coast areas. He’s hoping to teach the younger people of his village his wood-carving skills but no one seems interested to learn, he said. The village chief whittles away a sunny afternoon. 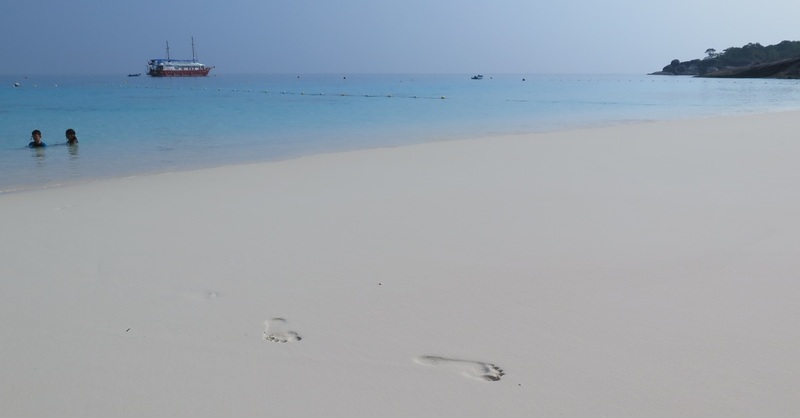 Strolling the sands of Gecko Cape, you can’t help but look out across the endless, sparkling blue sea, then over to the Westin Siray Bay luxury resort stretched across a headland in full view of the village, and wonder which direction the sea gypsies of Ko Siray look to when contemplating their future. 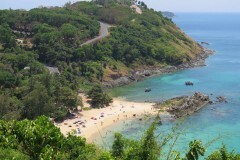 To find the village, starting from the east side of Phuket Town, take Sri Suthat Road east over the causeway to Ko Siray and stay on this road as it bends to the right at the clock tower circle, then turn right to Laem Tukkae at Soi Tsunami Village.